Corporation in the U.S. and other countries. accompanying such products and services. International Standard for Safety of Information Technology Equipment (IEC 60950). Functions like the left button on an external mouse. Turns the TouchPad on and off. Functions like the right button on an external mouse. White: The computer is on. Blinking: The computer is in the Sleep state. Off: The computer is off or in Hibernation. White: Num lock is on. Amber: All wireless devices are off. Off: The computer is off or in Hibernation mode. 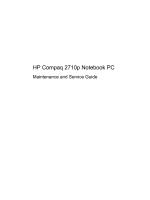 this guide and to the HP QuickWeb software Help. White: Computer sound is on. Amber: Computer sound is muted. White: Caps lock is on. Amber: The TouchPad is off. Off: The TouchPad is on. power button briefly to exit Sleep. button briefly to exit Hibernation. power button for at least 5 seconds to turn off the computer. and Security > Power Options. 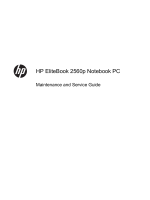 Or refer to the HP Notebook Reference Guide. press the button to open HP QuickWeb. button to open the default Web browser. does not perform any action or function. Mutes and restores speaker sound. Displays the Windows Start menu. combination with the fn key. Displays a shortcut menu for items beneath the pointer. when pressed in combination with the fn and num lk keys. pressed in combination with the fn key. Blinking white: The computer is in the Sleep state. White: A battery is close to full charge capacity. critical battery level, the battery light begins blinking rapidly. reaches a low battery level. White: The hard drive or optical drive is being accessed. Enable airflow to cool internal components. internal fan to cycle on and off during routine operation. Connects an optional docking device. Regulatory, Safety, and Environmental Notices. Connects an optional digital display device, such as a highperformance monitor or projector. Enables airflow to cool internal components. Attaches an optional security cable to the computer. Amber: The RJ-45 jack is active. Green: The RJ-45 jack is on. Reads and writes (select models only) to an optical disc. On: The optical drive is being accessed. Off: The optical drive is idle. White: The webcam is in use. Records video and captures still photographs. Provides light for the keyboard. and Environmental Notices that applies to your country or region. These notices are located in Help and Support. Connects an external VGA monitor or projector. Connects an optional USB device. Releases the battery from the battery bay. Supports a wireless subscriber identity module (SIM) card. The SIM card slot is located inside the battery bay. minor accidental spills on the keyboard. WWAN module slot, and the memory module slots. then contact technical support through Help and Support. (1) Product name: This is the product name affixed to the front of the computer. (2) Serial number: This alphanumeric identifier is unique to each product. (4) Warranty: This number describes the duration (in years) of the warranty period for the computer. description provided on the service tag. module cable is included in the Cable Kit, spare part number 651384-001. Montenegro, Sierra Leone, Slovenia, South Africa, South Korea, Spain, Sri Lanka, St. Kitts and Nevis, St.
See Plastics Kit on page 27 for more Plastics Kit spare part information. accompanying screws) away from the work area to prevent damage. CAUTION: Using excessive force during disassembly and reassembly can damage plastic parts. during the reassembly process. Improper cable placement can damage the computer. cables with extreme care; these cables tear easily. be sure that the optical drive tray is closed. Handle drives on surfaces covered with at least one inch of shock-proof foam. Avoid dropping drives from any height onto any surface. After removing a hard drive, an optical drive, or a diskette drive, place it in a static-proof bag. Avoid exposing a drive to temperature extremes or liquids. microcircuitry. Even if the spark is neither felt nor heard, damage may have occurred. Keep components in their electrostatic-safe containers until you are ready to install them. Avoid touching pins, leads, and circuitry. Handle electronic components as little as possible. If you remove a component, place it in an electrostatic-safe container. CAUTION: A product can be degraded by as little as 700 V.
To avoid hand contact, transport products in static-safe tubes, bags, or boxes. Keep ESD-sensitive parts in their containers until the parts arrive at static-free workstations. Place items on a grounded surface before removing items from their containers. Always be properly grounded when touching a component or assembly. Cover the workstation with approved static-shielding material. Use conductive field service tools, such as cutters, screwdrivers, and vacuums. these items only at static-free workstations. Avoid contact with pins, leads, or circuitry. Turn off power and input signals before inserting or removing connectors or test equipment. Grounding equipment must include either a wrist strap or a foot strap at a grounded workstation. connectors, use alligator clips to connect a wrist strap. worn in contact with the skin. The following table lists the shielding protection provided by antistatic bags and floor mats. This chapter provides removal and replacement procedures. computer. Make special note of each screw size and location during removal and replacement. provided on the service tag, located inside the battery bay. The product name affixed to the front of the computer. An alphanumeric identifier that is unique to each product. components and parts are needed. The duration of the warranty period for this computer. The computer feet are hot-melted to the base enclosure in the locations illustrated below. the computer on, and then shut it down through the operating system. and then unplugging the AC adapter from the computer. Turn the computer upside down on a flat surface, with the battery bay toward you. Slide the battery release latch (1) to release the battery. Remove the battery (2) from the computer. Install the battery by inserting it into the battery bay until you hear a click. Remove the battery (see Battery on page 41). Position the computer with the battery bay toward you. Slide the release latch (1), and then slide the cover toward the front of the computer (2). This section applies only to computer models with WWAN capability. computer. Be sure that the SIM is reinserted in the SIM slot after reassembling the computer. Remove the SIM (2) from the slot. Reverse this procedure to insert the SIM. Remove the service access cover (see Service access cover on page 42). Position the computer upside down, with the battery bay toward you. Disconnect the fan cable (1) from the system board. Loosen the two Phillips M2.0x4.0 captive screws (2) that secure the fan to the system board. that secure the heat sink to the system board. Slide the heat sink to the left until it clears the base enclosure (2). Remove the heat sink (3). sink, processor, and system board spare part kits. Reverse this procedure to install the fan and heat sink. Remove the fan and heat sink (see Fan and heat sink on page 44). Loosen the captive screw one-half turn (1). Lift the processor (2) straight up and remove it. the processor slot when you install the processor. Reverse this procedure to install the processor. Before adding new memory, make sure you update the computer to the latest BIOS. result in various system problems. Click Support & Drivers > click Drivers & Software. Click the link for the computer model. Select the operating system, and then click Next. Under Step 2: Select a Download, click the BIOS link. Click the link for the most recent BIOS. Click the Download button, and then follow the on-screen instructions. Position the computer with the front toward you. module. The edge (2) of the module opposite the slot rises away from the computer. Remove the memory module (3) by pulling the module away from the slot at an angle. Reverse this procedure to install the memory module. Bluetooth module cable is included in the Cable Kit, spare part number 651384-001. Disconnect the Bluetooth module cable (1) from the system board. Slide the cable (2) out of the clip and away from the routing channel. Using a thin tool, gently pry the outer edge (1) of the module away from the base enclosure. Rotate the module (2) away from the base enclosure. Reverse the above procedure to install the Bluetooth module. Remove the Bluetooth module (see Bluetooth module on page 50). Disconnect the speaker cable (1) from the system board. the speaker to the base enclosure. Remove the speaker (4) from the base enclosure. Reverse this procedure to install the speaker. Position the computer with the right side toward you. Loosen the Phillips M2.5x8.0 captive screw (1) that secures the optical drive to the computer. Remove the optical drive bracket (2). Reverse this procedure to reassemble and install the optical drive. included in the Cable Kit, spare part number 651384-001. Remove the Phillips M2.0Г—3.0 screw (1) that secures the modem module to the system board. Lift the modem module (2) straight up to remove it from the system board. Disconnect the modem module cable (3) from the modem module. Reverse this procedure to install the modem module. CAUTION: The WWAN module and the WLAN module are not interchangeable. 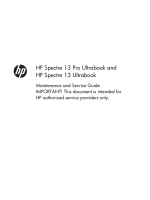 Remove service access cover (see Service access cover on page 42). Disconnect the WWAN antenna cables (1) from the terminals on the WWLAN module. NOTE: The black WWAN antenna cable is connected to the WWAN module вЂњMainвЂќ terminal. The white WWAN antenna cable is connected to the WWAN module вЂњAuxвЂќ terminal. Remove the two Phillips M2.0Г—3.0 screws (2) that secure the WWAN module to the computer. Pull the module (3) away from the slot at an angle. NOTE: WWAN modules are designed with a notch (4) to prevent incorrect insertion. Reverse this procedure to install the WWAN module. Disconnect the WLAN antenna cables (1) from the terminals on the WLAN module. blue WLAN antenna cable is connected to the WLAN module вЂњAuxвЂќ terminal. Remove the two Phillips M2.5Г—6.0 screws that secure the WLAN module to the computer (2). NOTE: WLAN modules are designed with a notch (4) to prevent incorrect insertion. Reverse this procedure to install the WLAN module. Loosen the 4 Phillips M2.0x5.0 captive screws (1) that secure the drive to the computer. Pull up on the tab (2) to remove the drive. If it is necessary to replace the drive connector, remove the connector (3) from the drive. each side of the drive, and then lift the bracket (2) away from the drive. Reverse this procedure to reassemble and install the drive. Loosen the three Phillips M2.0x8.0 captive screws that secure the keyboard to the computer. Turn the computer right-side up, and then open the display. opening where the fan was removed. Carefully turn the computer right-side up, with the front toward you. Rotate the keyboard forward until it rests upside down on the palm rest (1). Disconnect the mouse cable (2) from the system board. Open the ZIF connector (3) for the keyboard cable, and then remove the cable (4). Reverse this procedure to install the keyboard. Disconnect the RTC cable (1) from the system board. Remove the RTC battery (2) from the socket. Reverse this procedure to install the RTC battery. the ExpressCard slot and the Media Card Reader. Position the computer right-side up, with the front toward you. Open the ZIF connector for the power button cable (1), and remove the cable (2). Open the ZIF connector for the fingerprint reader cable (3), and remove the cable (4). Open the ZIF connector for the function board cable (5), and remove the cable (6). Close the display, and position the computer upside down, with the rear toward you. Remove the four Torx 8 2.5x7.0 screws from the hinges. at the front of the computer and the three Phillips M2.0x3.0 screws (2) in the optical drive bay. 10. Remove the base enclosure (7). Remove the ExpressCard blank (1) from the card reader, if you have not already done so . Open the ZIF connector for the smart card reader cable (2), and then remove the cable (3). Remove the tape (4) from the display cable, and then disconnect the cable (5). Pull the wireless cables (6) away from system board. then remove the system board (3). Reverse this procedure to install the system board. board and cable, and TouchPad bracket. Turn the computer upside down, with the front toward you. the left channel (2). Remove WLAN 2 and WWAN 3 and 6 from the right channel (3). Remove the two Phillips M2.0x7.0 screws (4) from the hinges. Slide the top cover toward you and then lift the cover (5) up to remove it. secure the TouchPad to the top cover. Release the TouchPad cable (4) from the ZIF connector (5), and then remove the cable (6). Reverse this procedure to install the TouchPad and the top cover. Remove the tape (1) from the power button cable. Remove the Phillips M2.0x3.0 screw (2) that secures the power button board to the top cover. Slide the board and cable (3) out of the plastic clips. Press down on the plastic clip (1) to release the metal bracket. Remove the bracket (2). Remove the Phillips M2.0x3.0 screw (3) that secures the function button board to the top cover. Remove the function button board (4). Reverse this procedure to install the function button board. Reverse this procedure to install the fingerprint reader board. Open the ZIF connector (1) for the smart card cable, and remove the cable (2). Disconnect the cables (3) and (4) from the TouchPad. cover, and then remove the smart card reader board (6). Reverse this procedure to install the smart card reader board, cable, and bracket. Turn the computer right-side up, with the front away from you. bezel until the bezel disengages from the display enclosure. use only with computer models not equipped with a webcam). prevent damage to the display enclosure, support it before removing the screws in the next step. bottom bracket to the computer. Remove the two Phillips M2.0x2.0screws (2) at the top corners of the display enclosure. Carefully close the display (1). Gently lift the display enclosure (2) away from display panel, which rests on the keyboard. Lift the tape (3) that secures the display cable to the back of the display panel. 10. Remove the cable from the display panel (4). 11. Remove the two Phillips M3.0x2.0 screws (1) from each display bracket. 12. Lift the display panel (2) away from the brackets. display components, remove the display panel, and then continue with the procedures in this section. Disconnect the webcam module cable (1) from the webcam module. Gently pry the outside edge (2) of the module away from the display enclosure. Remove the webcam module (3). covers (4) toward the outside of the brackets. Reverse this procedure to reassemble the display components. system is not working or will not load. only if USB legacy support is enabled. MenuвЂќ message is displayed at the bottom of the screen. press enter, or use a pointing device to click the item. screen, or use the up arrow key or the down arrow key. keyboard to navigate and make selections in Computer Setup. Select the File, Security, or System Configuration menu. corner of the screen, and then follow the on-screen instructions. Your changes go into effect when the computer restarts. Restoring defaults will not change the hard drive mode. Use a pointing device or the arrow keys to select File > Restore defaults. Use the arrow keys to select File > Save changes and exit, and then press enter. The menu tables in this section provide an overview of Computer Setup options. Set or change the date and time on the computer. hard drive in the system. memory installed in the computer. batteries installed in the computer. Restore the BIOS security settings to the factory default. Cancel any changes entered during the current session. Then exit and restart the computer. Some of the menu items listed in this section may not be supported by your computer. Select from a list of BIOS users. Select from a list of ProtectTools users. Enable/disable HP SpareKey (enabled by default). Enter, change, or delete a BIOS administrator password. questions and answers used if you forget your password. drive or the standard-voltage hard drive in the Upgrade bay. selected drive is destroyed permanently. Change the Computer Setup language. Set a Startup Menu delay (in seconds). Enable/disable Custom Logo (disabled by default). Enable/disable CD-ROM boot (disabled by default). Enable/disable SD Card boot (enabled by default). Enable/disable floppy boot (enabled by default). (UEFI) Boot Mode (disabled by default). Set the Legacy Boot Order. computer security (disabled by default). Enable/disable HP QuickLook (enabled by default). QuickLook Boot (enabled by default). Enable/disable HP QuickWeb (enabled by default). Technology) (select models only; disabled by default). Multi Core CPU (enabled by default). Intel HT Technology (enabled by default). Enable/disable Wake on USB (enabled by default). models only; enabled by default). Enable/disable the Ambient Light Sensor. Enable/disable the audio device (enabled by default). Enable/disable a modem device (enabled by default). Enable/disable the microphone (enabled by default). NOTE: All port options are enabled by default. Enable/disable the flash media reader. Enable/disable the Smart Card slot. Enable/disable AMT Setup Prompt (Ctrl-P). Enable/disable USB Key Provisioning Support. Enable/disable Unconfigure AMT on next boot. Enable/disable Firmware Progress Event Support. Restore the default security settings. NOTE: Certain restrictions and exclusions apply. Contact technical support for details. For detailed instructions, perform a search for these topics in Help and Support. save them for later use. start up (boot) the computer and repair the operating system in case of system instability or failure. Your initial and subsequent backups allow you to restore your data and settings if a failure occurs. You can back up your information to an optional external hard drive, a network drive, or discs. Store personal files in the Documents library, and back it up regularly. Back up templates that are stored in their associated programs. of your settings. The screen shot can be a time-saver if you have to reset your preferences. Display the screen you want to save. To copy only the active window, press alt+fn+prt sc. To copy the entire screen, press fn+prt sc. Open a word-processing document, and then select Edit > Paste. The screen image is added to the document. on the type of optical drive installed in your computer. using them for backup reduces the number of recovery discs required. Be sure that the computer is connected to AC power before you start the backup process. Select Start > All Programs > Maintenance > Backup and Restore. only), or create a system repair disc (select models only). prevent Windows from starting correctly. f11 recovery tools: You can use the f11 recovery tools to recover your original hard drive image. вЂњUsing a Windows 7 operating system DVD (purchased separately)вЂќ section in this guide. as the drivers, software, and utilities from the backup used for recovery. If possible, back up all personal files. If possible, check for the presence of the Windows partition or the HP Recovery partition. To check for the Windows partition, select Start > Computer. Windows 7 operating system DVD (purchased separately)вЂќ section. press f8 before the Windows operating system loads. search for these topics in Help and Support. Computer, click Manage, and then click Disk Management. system DVD (purchased separately)вЂќ section. the ESC key for Startup MenuвЂќ message is displayed at the bottom of the screen. Press f11 while the вЂњPress <F11> for recoveryвЂќ message is displayed on the screen. go to http://www.hp.com/support, select your country or region, and follow the on-screen instructions. Worldwide Telephone Numbers booklet included with the computer. operating system, as well as drivers, software, and utilities. This process takes several minutes. drive before the Windows operating system loads. When prompted, press any keyboard key. of system failure, you can use the backup files to restore the contents of your computer. continue to back up your system on a regular basis to maintain a reasonably current backup. Store personal files in the Documents folder, and back it up regularly. Select Start > All Programs > Maintenance > Backup and Restore Center. might prevent Windows from starting correctly. the partitions, select Start > Computer. the вЂњUsing a Windows Vista operating system DVD (purchased separately)вЂќ section. Restart the computer, and then press f8 before the Windows operating system loads. NOTE: If your computer includes a solid-state drive (SSD), you may not have a recovery partition. operating system DVD (purchased separately)вЂќ section. information, refer to the Worldwide Telephone Numbers booklet included with the computer. country or region where the equipment is purchased. region where the computer is used. The length of the power cord set must be at least 1.5 m (5.0 ft) and no more than 2.0 m (6.5 ft). evaluation in the country or region where the power cord set will be used. rating of 125 or 250 V AC, as required by the power system of each country or region. Standard Sheet C13 connector for mating with the appliance inlet on the back of the computer. where it will be used. grounding type with a NEMA 5-15P (15 A, 125 V) or NEMA 6-15P (15 A, 250 V) configuration. plug must be a two-pole grounding type with a Japanese Industrial Standard C8303 (7 A, 125 V) configuration. household waste. Follow the local laws and regulations in your area for computer battery disposal. handling the backlight to avoid damaging this component and causing exposure to the mercury. backlight. When you remove these components, handle them carefully. authorities, or see the Electronic Industries Alliance (EIA) Web site at http://www.eiai.org. be disassembled to gain access to the backlight (1) and the liquid crystal display (LCD) panel (2). from one computer model to another. the display bezel until the bezel disengages from the display assembly. Remove the display bezel 3. Disconnect all display panel cables (1) from the display inverter and remove the inverter 2. Remove all screws (1) that secure the display panel assembly to the display enclosure. Remove the display panel assembly (2) from the display enclosure. Turn the display panel assembly upside down. Remove all screws that secure the display panel frame to the display panel. 10. Remove the display panel frame (2) from the display panel. 11. Remove the screws (1) that secure the backlight cover to the display panel. 12. Lift the top edge of the backlight cover (2) and swing it outward. 13. Remove the backlight cover. 14. Turn the display panel right-side up. 15. Remove the backlight cables (1) from the clip (2) in the display panel. 16. Turn the display panel upside down. 17. Remove the backlight frame from the display panel. backlight to avoid damaging this component and causing exposure to the mercury. 18. Remove the backlight from the backlight frame. 19. Disconnect the display cable (1) from the LCD panel. 20. Remove the screws (2) that secure the LCD panel to the display rear panel. 21. Release the LCD panel (3) from the display rear panel. 22. Release the tape (4) that secures the LCD panel to the display rear panel. 23. Remove the LCD panel. 24. Recycle the LCD panel and backlight.